The monthy clinic in N. Phoenix was on 8/16 this month. We usually do about 50 cats at these clinics, giving caregivers a weekend option in the N. Valley. I was contacted by a caregiver who wanted "me" to trap for her. She had seen the article in the paper and called around to various places and everyone said get "Pam" to trap for you. She was also willing to make a nice donation so this "sweetened the pie". There are so many caregivers wanting help it is difficult to get to them all, but this one sounded sincere and, of course, the nice compliment helped. Of course there were the usual suspects in the neighbood wanting the cats removed and who were threatening to do bad things to them...she definitely needed help. 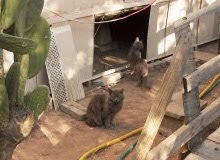 This was another older central Phoenix neighborhood with a LOT of free-roaming cats. The neighbors had already TNR'd about 10 cats down the street. She estimated there were about 20 cats to TNR. Well, we ended up trapping 22 cats on 8/23 and three the next night for a total of 25. As often happens 82 cats (not 50) showed up for the clinic on 8/16 so we had to call in a second vet. Fortunately we were able to find one to step in on a moment's notice. There always seems to be not enough or too many cats - well, one thing for sure - I'll never complain about too many cats at a clinic! I was set to trap five cats on 8/18 for a lady I'd helped in the past. There was a mother and four kittens. The mother, now an adult, was the one kitten I did not catch last year. This shows that one has to catch ALL the cats in the colony. This does require perservence but it pays off in the end. I caught all five. I had also dropped off 10 traps that same night to someone else who could trap on their own. Well, the 10 cat job turned in to 27 cats over a two day period. Turned out the neighbor had lots of cats and kittens in the back yard. On 8/19 I ran out of vet slots and ended on back on the Healing Hearts mobile with seven cats. This was truly a "drive by spay and neuter". I backed up to the van, unloaded, and was out of there in two hours. I was able to help out on the mobile. Thanks to Jan and Dr. Kit for helping out in a pinch! I picked up everyone for aftercare on both 8/18 and 8/19 - It's a blur now just what happened since it is a week later. All I know is I'd helped TNR a total of 57 cats so far that week and had lots of cats in the garage to feed and water each night. The cooler lowers the temperature anywhere between 15 and 20 degrees F.
I had organized a trapping in a large trailer park for the clinic on Sunday, 8/23 (part of next week's blog). The manager was on board and had contacted the feeders about not feeding. Well, somehow there was a communication problem, probably due to the Spanish/English translation. I got a call mid-morning from the manager of the park and one of the feeders had nine cats in two cat carriers and had brought them up to her office! Now what? I released the 10 cats at the trailer park in the early AM. We'd be back down there that night to trap for the Sunday clinic on 8/23. But that trapping episode will be part of next week's blog...stay tuned. The Spay Neuter Hotline TNR program is now nearly six months old and we have helped about 5,000 cats. We need your help. Please consider a tax-deductible donation to help us help more cats. Or, consider becoming a member of ADLA. Click here to join or donate.